Reflecting on Dark Delicacies signing as I meet my 3 month blogging goal - Colette Freedman is a top Hollywood Script Doctor who has also ghost written several novels. I did it. I blogged every day for three months without fail. Will I continue? Hmmm. Well, it takes 28 days to make or break a habit…and I’ve rather enjoyed this habitual task of daily blogging. I will probably ease up a little… give a bit more quality over quantity; however, I’ll keep blogging. In the meantime, a bit about my signing at Dark Delicacies yesterday – it was… in a word… amazing. I was stunned at the number of people who showed up and I sold out of stock fairly quickly. 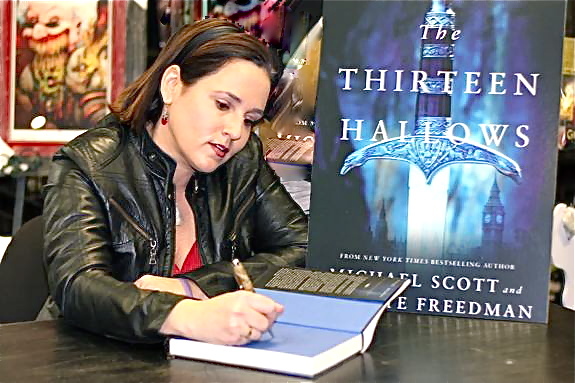 Thanks to everyone who supported independent bookstores by buying a copy of The Thirteen Hallows at the store and a special thanks to Del and Sue, who were very hospitable and did a terrific job hosting the signing. I had a great time at the signing, too, and just wish we’d had more time to visit. Thirteen Hallows is on my Christmas list – I’m looking forward to reading it!